Why this volunteer Teaching Internship? India is the second largest English-speaking nation in the world just behind USA and most preferred destination for English language Teachers. TEACHING in INDIA VOLUNTEER INTERNSHIP program is aimed to give international teaching experience and exposure to teachers/undergraduates/ESL/TEFL/TESOL holders who aspire to accomplish global teaching skills. Teaching in India provides teachers or prospective teachers a life time opportunity to develop and demonstrate their ability to assume the responsibilities of a full-time English teacher in kindergarten, primary, secondary and high schools. English teaching venues are in the States of southern and Northern India. 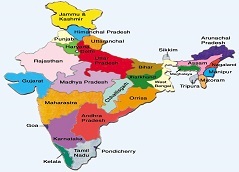 India is a federal union of states comprising twenty-nine states and seven union territories. What is the structure of the educational system? Schooling has been conducted in three different stages - Primary, Secondary and Higher secondary. The Primary grade is classified into Lower primary (grade 1-4) Upper primary (grade 5-7) and secondary grade from 8 to 10 is called High school and 8 to 12 is called Higher secondary school. Teaching in India will help to show the value of understanding the world's unique cultural heritage to Indian school students. Teaching in India will be a good opportunity for interns to introduce their country's wonderful heritage to younger generations while deeply involved in cultural exchange activity in India. Schools are administered through the channel of government or private sectors. The curriculum of India schools is a mixture of State/ CBSE/ICSE syllabus which is a choice open to the students. At dawn it is curious to watch children carrying school bags and swiftly walking through bustling traffic jam to reach their schools in time, an amazing scene of eagerness of the children in their pursuit of knowledge. Usually the schools start at 9.00 am in the morning and ends at 3.00 pm in the evening. In between children have interval and lunch break. Normally the schools function for 6 hrs in a day. Some schools even start at 8.00am and ends at 2 pm keeping the same teaching hours and interval. Astonishingly India is a floodgate of numerous languages. There are 18 official languages and 96 unofficial languages. A child at the level of 1st grade (6 years) has to study state language (Malayalam), national language (Hindi) and English along with subjects like mathematics, social studies, science, arts, computer science, moral science etc. So a child at the level of 1st grade onwards has to learn 3 languages at a time and no one can see this unique feature in any stream of education or any form of education anywhere in the world. In some schools children have the option to select a foreign language (mostly French and German) as their optional third language. What is the status of a teacher in India? Indian teachers occupy an elated status in the society. Teachers are highly respected in the society as torch bearers of divine knowledge and responsible for moulding the future of younger generation of India. In Indian society children are taught to respect their parents first and then their teachers. In the status of hierarchy the teachers are second to parents. Children are indoctrinated to imbibe the Indian philosophy of Matha, Pitha, Guru, Daivam, (Mother,Father, Teacher, God). What one can expect from this Internship? English Teaching in India provides a unique opportunity to the interns to take classes in Kindergartens, Pre-school, Elementary school, Middle school and High school. In addition, the teaching interns will have the opportunity to assist in academic works and participate in academic seminars and workshops. An internee who participates in the internship program becomes part of a unique Indian culture and community sharing knowledge of his culture and language with teachers and students. In return an internee can experience life in Indian culture and community and acquire sharing of knowledge, skill and learn different languages. The internship program is open to teachers/graduate or under graduate / ESL/ TEFL/ TESOL holders who have genuine interest in teaching and update their teaching skill. The duration of the volunteer teaching in India will be 4 months to 1 year. CREDIT CERTIFICATES after successful completion of English teaching in India. Free two day beach holiday upon arrival. Are you a dedicated teacher aspiring to get training and experience in English teaching in India? Do you want to upgrade your resume, embrace the exhilaration of Indian life, gather valuable teaching experience or build new life skills? If YES this internship offer is for you.